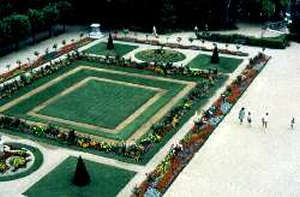 Town Hall Garden of Bourges : These gardens lie at the foot of the cathedral and are composed of 2 distinct parts : - the first, prolonging the former Archbishop's Palace, is a formal geometrical garden, with flowers, neatly trimmed trees, immaculate lawns .. - the second, which is densely planted with trees radiating from the pond. A brief history : the famous gardener Le Nôtre was consulted for this project in 1681 but the first drafts were, apparently, not his work. Of particular note : the bandstand (1910) and the 4 monumental bronze vases representing the 4 seasons. These were created by Louis-Léon Cugnot at the end of the 19th century, added to the supplementary inventory of historic monuments in 1990 and delicately restored in 1994.